What Do Brown Spots on My Dog's Gums Mean? When you first get your puppy or dog you should research the breed to find out what types of gum and tooth patterns are considered normal. For instance, for some breeds it might be common for brown spots to form on the gums. However, if you notice brown spots forming on your dog's gums where they haven't been before, you should contact your veterinarian to discuss dental hygiene issues. Brown spots on your dog's gums could be a sign of gum infection, such as gingivitis. The best way to make this determination is to have your vet inspect your dog, but you can also examine your pet at home. Look for redness or swelling along the gum lines near the brown spots. You might even see evidence of slight bleeding. Also, if your dog seems to be chewing on one particular side of its mouth, it's possible it has a painful gum infection and needs to see your vet. Some canine breeds have normal pigmentation of brown spots on pink gums, according to the American Kennel Club. Pink gums are a sign of healthy gums, but when your dog has normal brown spots on the gums it becomes more challenging to determine when, if ever, your dog has contracted gum disease. Keep an eye on the normal brown spots and see if they grow, change or multiply. More brown spots on the pink gums could mean that there is an infection, but if the spots stay the same, this may not be need for concern. Gum infections that are not treated can spread throughout the body and lead to other types of infections or health problems for your dog. Consequently, it is important to attend to your dog's dental health on a preventative basis, and any time you suspect gum disease. Brown spots on your dog's gums that are representative of gum disease can eventually cause the teeth to rot, loosen and fall out, making it difficult for your dog to chew food and eat comfortably. 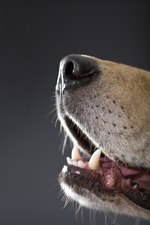 Gum disease can be prevented with good oral hygiene that you force upon your dog. You can brush your dog's teeth to get rid of tartar and plaque, using a special doggie toothbrush and toothpaste. Another prevention tactic is to give your dog dental chew treats that help massage the gums and remove tartar as the dog chews on them.